Living with inflammatory bowel disease (IBD) can be extremely debilitating, as it can affect nearly every aspect of a person’s life. The condition affects nearly 1.5 million Americans, with several more being affected around the globe. The most common forms of IBD include Chron’s disease and ulcerative colitis, both of which present as major risk factors for colon cancer. “Colorectal cancer can develop from precursor lesions that can be caused by inflammatory bowel disease over periods of 10 to 15 years, which provides an extended time for preventive measures,” Dr. Susanne Talcott, Texas A&M AgriLife research scientist. Several medical interventions have been implemented to help reduce the impact that living with inflammatory bowel conditions has on its victims. Medications and lifestyle changes are commonly prescribed. However, a new study finds that mango consumption could have a positive effect on inflammatory bowel disease. There have been multiple studies demonstrating the benefits of consuming fruits and vegetables, including pomegranate, citrus, and curcuminoids. Polyphenolics have been found to reduce inflammatory processes, such as those found in IBD. Mangos specifically contain abundant amounts of gallotannins, a group of large molecular polyphenols that can be broken down to small, absorbable, bioactive molecules within the gastrointestinal system. 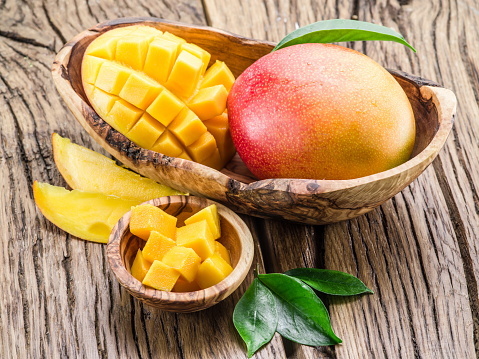 A study was designed to evaluate the effect that mangos had on those with mild to moderate Chrons and ulcerative colitis. Participants ate mango in addition to their prescribed drug treatment. The researchers found that the symptoms of each type of IBD were significantly reduced, as were several biomarkers associated with inflammation. The researchers go on to say that the presence of GRO—a molecule associated with colon cancer growth—was also significantly reduced. They also stress the importance of specific gut bacteria and other beneficial probiotics found in the gut that was increased after the consumption of mangos. Short chain fatty acids, which are essential for a healthy intestinal tract, were also found to be significantly increased. “Taken together, our results indicate mango intake exerted beneficial effects on the progression and severity of the IBD after eight weeks of nutritional intervention. All subjects who completed the study stated they would continue to consume mangoes regularly and will recommend this to others who suffer from IBD and also tell their physicians,” said Dr. Talcott.